A simulation of oil and gas leakage during the Deepwater Horizon disaster finds that the main chemical dispersant used improved air quality for emergency responders. As the crippled Deepwater Horizon oil well spewed nearly 5 million barrels of crude oil and gas into the Gulf of Mexico in 2010, cleanup crews attacked the spill with almost 2 million gallons of Corexit, a controversial brand of dispersant used to break up oil into smaller droplets. The research finds that the dispersant diminished the average oil droplet’s volume by more than thirtyfold, which reduced the amount of volatile oil components that reached the surface of the ocean. Now, new modeling of the oil’s behavior as it leaked out of the well has simulated the characteristics of the spill’s oil and natural gas bubbles with and without the addition of Corexit EC9500A, the main dispersant used against the spill. The research finds that the dispersant diminished the average oil droplet’s volume by more than thirtyfold, which would have likely made droplets dissolve more easily and rise more slowly, allowing them to become trapped below the sea surface. The droplets’ shrinkage would have reduced the amount of volatile oil components that reached the surface of the ocean and, in turn, dramatically improved air quality for responders, the researchers report. In the model’s simulations, droplet diameters decreased from approximately 4 millimeters without dispersant to 1.3 millimeters with it. The new model indicates that dispersant use lowered the amount of volatile organic chemicals in the atmosphere by about 30%, on average. For chemicals most harmful to humans, the reduction was far steeper. The atmospheric concentration of benzene, a component of crude oil, decreased 6,000-fold, for example. That had big implications for cleanup crews working on the site. The new study shows “how the dispersant was effective in retaining [more] of the hydrocarbons at depth than would otherwise be the case. That’s really important,” said Gary Andersen, a senior scientist at Lawrence Berkeley National Laboratory in Berkeley, Calif., who has also studied the effects of dispersants. Arey and his colleagues published the new work on 28 August in the Proceedings of the National Academy of Sciences of the United States of America (PNAS). Dispersants work similarly to how dish soap breaks up grease. The chemicals in the dispersants, which are typically used on surface slicks, lower the interfacial tension of the boundary between oil and water, which allows waves and wind to break up a slick. “As a consequence, less oil reaches the coastline because it’s dispersed into the environment,” Arey said. 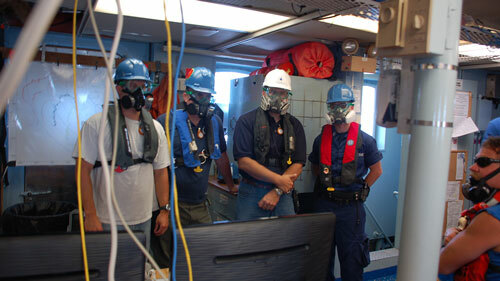 But how dispersants would behave when used at depth was still an open question in 2010. Since then, numerous scientists have attempted to answer that question. In theory, a dispersant would have reduced the size of the oil droplets under the water’s surface. Smaller droplets would be more likely to get trapped within the water, rising to the surface more slowly. If microbes degraded the oil droplets or if they were trapped, they might not reach the surface at all. Limited underwater observations near the spill with a camera mounted on a remotely operated vehicle (ROV) captured some data on droplet sizes. Operated by a team led by the Woods Hole Oceanographic Institution in Woods Hole, Mass., the ROV looked at droplets 1–9 kilometers from the wellhead, observing sizes of 0.03–0.40 millimeter. These sizes are consistent with the model, which simulated droplets only 200 meters from the leaking wellhead, according to the paper. The model’s larger droplets would have broken up by the time they drifted kilometers from the disabled oil rig because of natural turbulence and the dispersant’s effect. However, the in situ measurements are “a relatively small set,” Arey noted. Thus, many researchers have turned to lab experiments or models. A 2015 modeling study by scientists at the University of Western Australia in Perth and the University of Miami in Florida found that mechanical energy did most of the dispersing. 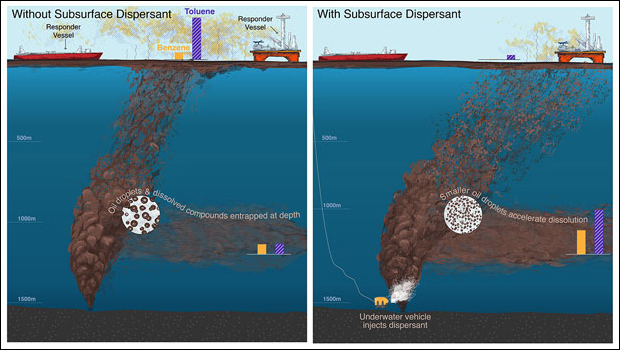 In addition, regarding how much spilled oil remained at depth rather than breaching the surface, “the simulations suggest that the application of dispersant actually made only a marginal difference,” the authors wrote. They estimate that only 1%–3% less oil reached the surface because of dispersants. Using another model last year, Jeremy Testa, a researcher at the University of Maryland Center for Environmental Science in Solomons, reported droplet sizes similar to those simulated in the new paper by Arey and his coauthors. In experiments reported in June, also in PNAS, Andersen and his colleagues recreated the presumed conditions of the Deepwater Horizon spill in bottles, rotating the bottles so that the oil droplets didn’t become slicks. They found that the dispersant did not inhibit microbial work. Microbes degraded most of the oil from the spill “in a matter of weeks or months,” Andersen said. A lot of the work was done by a newfound organism now thought to be part of the genus Bermanella. The model used in the new August PNAS study allowed the scientists “to fill in everything that happened from the wellhead to the sea surface and describe in detail what was happening at the wellhead itself,” according to Arey. He said that he hopes studies like his can be used to help plan for future oil spill management. Citation: Kaufman, R. (2017), Deepwater Horizon dispersant cleared the air, new model shows, Eos, 98, https://doi.org/10.1029/2017EO082169. Published on 14 September 2017.